Wintertime fishing, birding or just bike riding with my daughter Maia in Japan is indelibly linked with one of my happiest food memories: stopping by a local bakery and purchasing piping hot steamed buns filled with sweetened bean filling (anpan) or marinated pork (nikuman). The filling was so hot we’d have to be careful not to burn our tongues. Those steamed buns were the perfect on-the-go snack on chilly days. 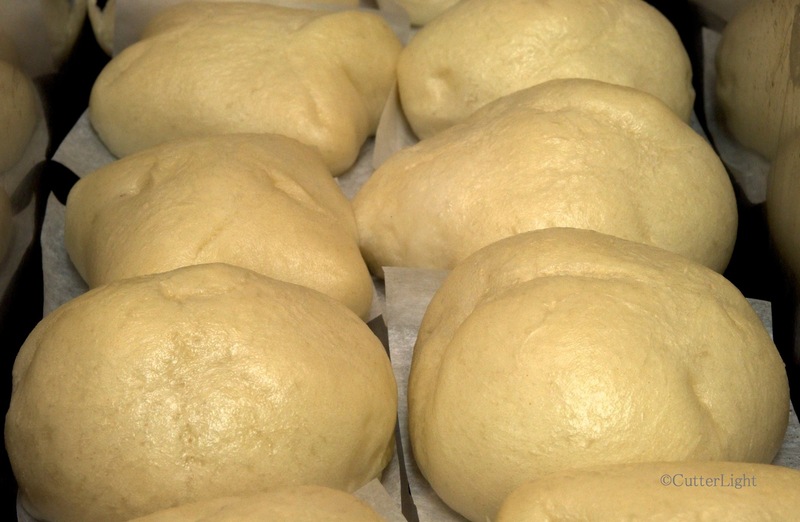 Known as bao or baozi in China, steamed buns were on our list of items to try making this year. With Maia in Point Hope visiting over winter break from Berkeley, the anpan and nikuman Barbra created turned out just like the ones we’d enjoyed back in Japan. After devouring anpan with sweet red bean filling, we all could imagine the buns stuffed with a variety of other fillings: vegetable mixtures, curry, barbequed caribou, fruit, or even chocolate! Light, freshly steamed, piping hot and ready to be lifted out of our fish poacher, anpan definitely fit the category “comfort food.” The ones we made were about the size of tangerines. Because we rely on our Zojirushi bread machine to regulate the temperature for consistently rising dough, the following recipe has been created for the dough cycle of a bread machine. As an alternative to steaming, the dough can be given an egg wash and baked at 350 degrees F for 15 minutes. A recipe for Caribou Cha Sui follows the anpan recipe below. Click here to see a recipe for sweetened red bean filling. Place first 6 ingredients into pan of bread machine in the order recommended by the manufacturer. Set machine to dough cycle. Start. After cycle is complete, punch down dough on a lightly floured surface. Sprinkle baking powder evenly over surface of dough. Divide dough in half. Place half of dough in a covered bowl. Cut the remaining dough into 12 equal pieces. 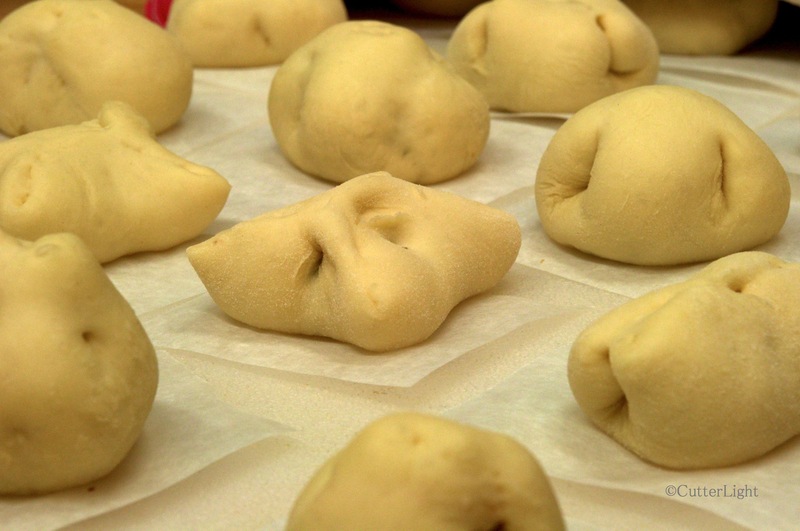 Roll dough pieces into balls and then flatten. Make sure that edges are thinner than the center. Fill dough with 1 teaspoon of desired filling. Bring edge of circle up to pinch closed so that none of the filling is showing. Place filled dough on a small piece of waxed or parchment paper. Continue with remaining dough balls. Repeat process with dough that has been covered in the bowl. Let all filled dough balls stand covered for another 30 minutes. Steaming process could be done in a steamer basket or a wok. I have a fish poacher with a raised grate and used this to steam the buns. Bring water and 1 tbsp vinegar to a boil in steamer. Place as many buns as will fit in steamer, allowing for about an inch between buns so that they don’t stick together as they cook. Cover with lid. Steam over boiling water for 15 minutes. The first step is to create a marinade and let the tenderized caribou absorb the flavors overnight in the refrigerator. The next day, make a filling with the marinated caribou and stuff the anpan. The filling will make enough for 6 steamed buns (nikuman). This recipe is best started a day in advance to ensure the meat is properly marinated. Place tenderized caribou in a glass bowl or container and completely cover with marinade. Cover glass container and place in refrigerator overnight. In a medium-sized frying pan, heat 1/2 tbsp oil over medium-high heat until a drop of water sizzles in pan. Sear caribou on each side to seal in the juices. Remove pan from heat and place cooked meat on a cutting board to rest a few minutes. Dice cooked caribou into 1/4 inch cubes and set aside. Wipe out the pan used to cook the caribou. Heat 1/2 tbsp oil over medium heat. Add diced caribou and onion to pan. Cook for about 1 minute, stirring occasionally. Add soy sauce, honey and sesame oil to pan. Stir fry for another minute. Add cornstarch and stock mixture to pan and continue cooking until sauce thickens, about 2 minutes. Place caribou in bowl to cool prior to filling anpan rolls. See above directions for anpan to complete recipe. *Point Hope, like many bush villages in Alaska, is dry. Every now and again a certain meal calls for a special adult beverage. At these times we miss being able to enjoy an alcoholic beverage. Most of the time we are content to wait until summer, which we spend in the “wet” town of Seward, Alaska or traveling. When we lived in Hawaii, we used to eat a sweet pork steamed bun called a Manapua. It was amazing how popular they were. You could point to them on the cart at the local Dim Sum restaurant or grab one next to some spam musubi at the 7-11. Those were the days! When you guys get back to the “wet” town of Seward, we’ll have to cook you up Oksana’s bear or caribou gyoza, complete with dipping sauces. We can all enjoy adult beverages together! The chocolate pots were awesome! The recipe is now in my recipe Hall of Fame!